Hand of the Gods Top Decks - HotG News, Cards, and Decks! Hand of the Gods is fully releasing on February 20th, 2018! Here are the patch notes for this major patch/update. Hand of the Gods’ HRX Founder’s Tournament 2018 Deck Lists! 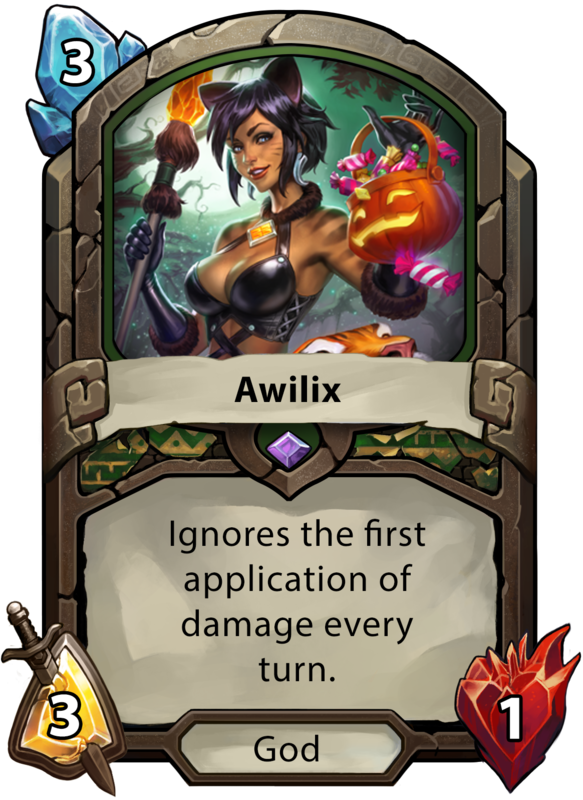 Here are all of the deck lists from the Hand of the Gods HRX Founder’s Tournament! Check out the brackets here. Here’s the new patch notes for the “Chaos in Rome” patch! I’m currently adding the new cards as well as updating the reworked ones. Warcry: Swap your hand with your opponent’s. Replace your Leader Ability with: Discover a card in your deck. Deal damage equal to your opponent’s unused mana. Cost increased from 3 to 8. Select a friendly unit. Whenever it is targeted, spawn a 4/4 copy of it. Replace your Leader Ability with The Kraken! New Ability: Warcry: Return all enemy units on Poseidon’s row to their owner’s hand. Add a random god to your hand for each returned. Cost increased from 2 to 3. Silence all enemies adjacent to either Summoning Stone. Decks can only include cards that cost 5 or more. Players start with 5 mana. Rewards: 2 core packs, 100 favor, Cutesy Merdusa. Players can only queue with decks that have Spells and Ranged units. No melee units are allowed. Rewards: 2 core packs, 100 favor, Cutesy Izanami. Map includes only three rows of playable tiles. All normal decks allowed. Rewards: 3 core packs, 150 favor, Cutesy Neith. Players can only queue with decks that have ALL Egyptian or Chinese cards. All other pantheons are not allowed in this queue, nor are neutral cards. Rewards: 3 core packs, 150 favor, Cutesy Bastet. Accensus can no longer move through blocked paths to hit a unit. Added a tooltip for the reincarnated version of Tribute of Stone. Fixed an issue where cards would occasionally get stuck in hand. Fixed an issue where Leader Abilities would not work after using Nox’s Warcry. Fixed an issue where Ra’s Leader Description would get cut off on lower resolutions. Fixed an issue where Silence would not affect Spartan, Osiris, and Pillar of Fortitude. Fixed an issue where the Turn Timer could could get stuck and lock players out of action. Player names no longer stay on screen when conceding a game from the Menu. Sanctuary now properly prevents poisoned units from dying. Updated Bakasura’s card text to properly reflect his Warcry. Here are the new patch notes for the upcoming “Warrior’s Way” patch! Both players spawn the highest costed unit in their hand. Three-bladed Spear: 1 Mana, Deal 2 damage to a unit. Whenever this unit kills a unit, it can move and attack again. Set the attack and health of all units to 2. Heal a random friendly for 1 at the end of your turn. Pillar of Life is destroyed at the start of your next turn. Mana Cost Increased from 3 to 8. Attack increased from 3 to 5. Health increased from 3 to 8. New Ability: Warcry: Kill a friendly unit and gain attack equal to its cost. Afterlife: Spawn a 3/3 Avatar. Mana cost increased from 1 to 2. Mana Cost increased from 8 to 9. Attack increased from 4 to 7. Health increased from 4 to 5. New Ability: At the end of your turn, spawn a random unit with Afterlife from your Graveyard. New Passive: Whenever Spartan kills a unit, spawn a random unit that costs 2 and give it Charge. Decks can not contain any Spell Cards. Players can only use decks that include only cards from the Neutral Pantheon. The map contains two rock formations that block unit movement. Players can only create decks that contain Rare, Epic, and Legendary Cards. Only decks created from your collection and meeting the deck requirements will be eligible for use in the Gauntlet. This must be done before entering the queue. Rewards will be granted to players who achieve 5 wins. Monday at 5am EDT – Friday at 5am EDT players will be able to access two weekday gauntlets. Friday at 5am EDT – Monday at 5am EDT players will be able to access two weekend gauntlets. After a player has won or lost a specific gauntlet type, they will not be able to enter that same gauntlet again until the daily cooldown resets at 5am EDT. Players can now drag and drop units from their hand to the board. Cards with castable states, such as spells, still require the player to confirm the action. The color highlight when targeting units, tiles, or Summoning Stones has been adjusted from Purple to Gold to better indicate to players what is being targeted. Units affected by charge can no longer target summoning stones on the turn it is played. Warcry now grants Afterlife to Isis as well. Mana cost reduced from 3 to 1. CONSOLE – Thunderdome arena now properly displays the back button callout. Deck Tracker now properly reflects units generated by Hades ability. Fixed an issue where some card images in the Deck Editor were not properly filling their containers. Soul Bind will no longer kill attached units if one is recalled back to hand. Stealthed units will now properly take damage from Fire Tiles. Zabin Scout no longer generates a Zombie from enemy unit deaths. Here are the new patch notes for the upcoming “The Winged Goddess” patch! Warcry: Spawn a Wind Elemental. Afterlife: Add a random spell to your hand. Cost increased from 3 to 9. Attack Increased from 2 to 9. Health increased from 4 to 9. New Ability: At the start of your turn, move to a random enemy and attack it. This counts as normal move and attack. Health increased from 1 to 3. New Passive: Whenever this unit kills a unit, spawn a 2/2 Zombie. Cost reduced from 1 to 0. New: Spend all remaining mana to spawn a Zombie with attack and health equal to the amount spent. New Passive: Whenever this unit kills a unit, add a copy of it to your hand. Cost reduced from 3 to 1. New: Replace all friendly units in a 2×2 area with a random unit that costs 1 more. Players have 10 mana every turn. Players can only create decks that contain Free and Common cards. Players can only queue with decks that have ALL Hindu or Mayan Cards. All other pantheons are not allowed in this queue, nor are neutral cards. In-game frames per second can now be limited to match the refresh rate of your monitor on PC. This feature will reduce resource usage, and will be to the benefit of laptops and older computers. Quests that required players to play 30 gods (from a particular pantheon) have been reduced to 20 gods. Quest that required players to play 60 gods (from any pantheon) has been reduced to 50 gods. Gauntlet Rewards now only require 5 consecutive wins within a day, down from 8. Favor gains from gaining a Leader Mastery Level have been reduced to 50 Favor, down from 100, in preparation for Leader Mastery Rewards. New images have been added to the in-game UI to reflect Leader abilities. Ranked rewards have arrived! With patch 0.35, all players’ ranks will be reset. Lernaean Hydra card text updated to more accurately reflect its ability (+1/+0). Fixed an issue where Pillar of Fortitude was not properly giving the buff to all units. Fixed an issue where if Nox was buffed before using her Warcry she would not exit the unit still buffed. Fixed an issue where minimizing a Discover panel would prevent the user from being able to select a card. Fixed an issue where acquisition popups would not always appear. Fixed an issue where Recursive Vitality would sometimes take mana from players when returned to hand. Fixed an issue where Avatars from Call of Avatar would not gain Charge. Lots of new stuff coming in the Fate and Time 0.34 Patch: New Cards, Holiday Pack, Gauntlets, and Balance changes. Player turns last 20 seconds. Warcry: Deploy an axe. Friendly units that end their turn on it gain +4/+4 and consume it. Discover a unit that costs 7 or more and reduce its cost to 0. Give a God +1/+0. 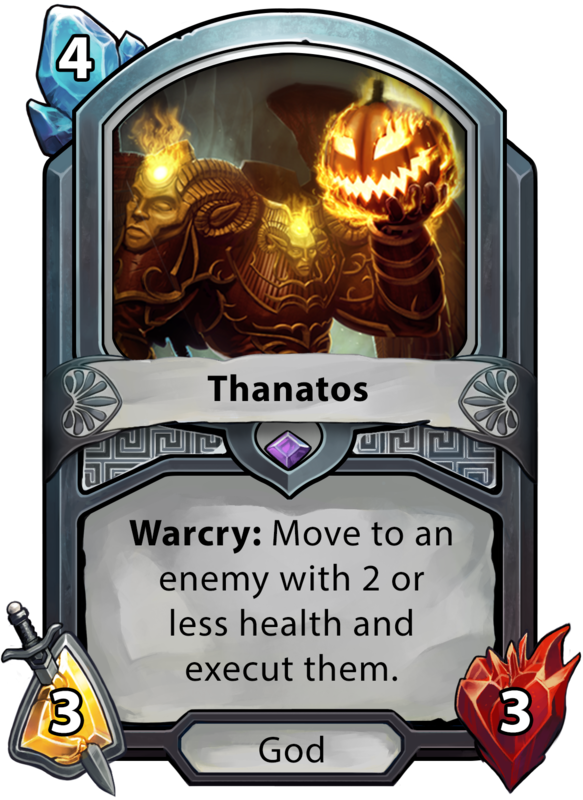 When you play a God, return this card from your graveyard. Select two units that cost 4 or less. When one dies, the other dies. Discover a card with Afterlife. Get ready for the Winter Holidays with the Hand of the Gods Holiday Pack! The Holiday pack will replace the Halloween Pack in the store on all platforms with the release of OB 0.34. The pack includes Limited Edition Skins for Hand of the Gods, featuring a new unit model, Special FX, Sound FX, and Card Art. 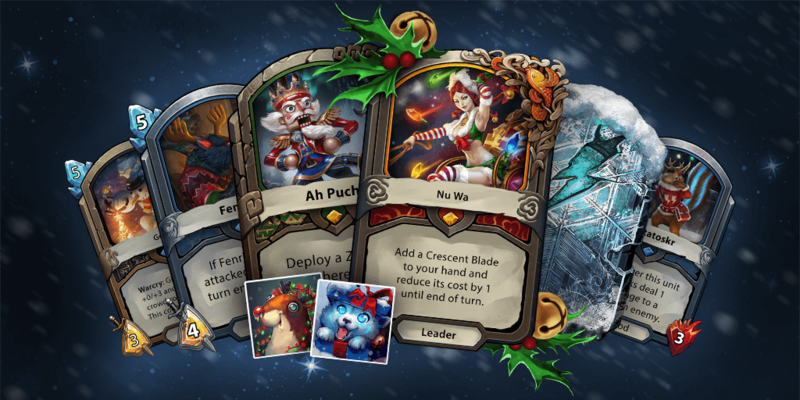 In addition to unit skins, the Holiday Pack includes exclusive Leader skins for Ah Puch and Nu Wa, along with two Limited Edition Holiday Avatars, and a Holiday Card Back! Player turns last 30 seconds. Player’s draw from their opponent’s deck. Decks must include at least 15 unit cards. Players can only have one copy per card in their deck. Rewards will be granted to players who achieve 8 wins. Spawned Units will now always spawn in random tile adjacent to your summoning stone. Gods returned to your hand now cost 1 less. Attack reduced from 4 to 3. Enemy unit killed now leaves behind a friendly Zombie. Now leaves behind a friendly Zombie. Now only gains +1/+0 while Skadi is in play. Heals to full at the end of each turn. Whenever this unit deals damage it gains +1/+0. Health increased from 3 to 4. Health reduced from 7 to 5. Attack increased from 4 to 5. Now gives +2/+2 to all friendly Zombies. Health reduced from 6 to 5. Added a final step in order of operations to end all end of turn effects properly. Added Cursed Dragon’s Poison Pools to the combat log. Ao Kuang’s bonus Spell Damage no longer applies to Fatigue Damage. Blade Forge effect no longer triggers during death animation. Fixed an issue where Aspect of Life was drawing a card if you had no other cards in hand. Fixed an issue where Pillar of Fortitude was not granting +0/+2 to Pillar of Patience, Pillar of Parity, and Pillar of Retribution. Fixed an issue with where the Poisonous card would not properly deal damage if its Mana cost was increased. Fixed an issue where Rapacious Satyrs ability was activating before instantaneous warcries (such as Poseidon). Gauntlet wins will now properly progress quests. Phantom Grasp now properly pauses the Turn Timer during its animation. Siege Master can now only target enemy structures with his Warcry. Warcry: Poison all units on target column leaving a poison pool on tiles without units. Units that end their turn on these tiles are poisoned. If Fafnir is including in your deck, you can not play cards that cost 5 or more. Increased the size of selected cards. Replaced model viewer with larger preview for all card types. Reduced the number of cards per page by 2. Improved card counter with better indication of how many of a specific card is already in your deck. The playable grid is now always visible. New mana count treatment with larger sizing. Deck tracker and taunts have been moved under the menu in the top left. FOV has been tightened to give a more up close view of the board. Cost increased from 2 to 4. The Hunt – Open Beta Patch 0.32 Patch Notes – New Cards, Deck Search, and The Gauntlet! A big patch is scheduled to be released next week and will introduce a bunch of new cards, deck search and filtering, and the new queue: The Gauntlet! 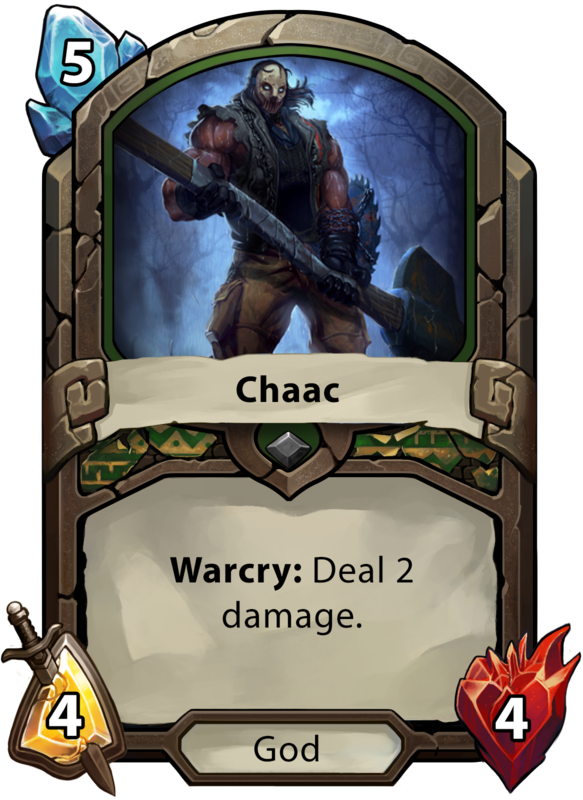 Warcry: Swap the attack and health of a unit. Afterlife: Return a random god from your graveyard and reduce its cost by 1. Silence an enemy and trigger a friendly god’s Warcry. Target a unit. The owner’s cards cost 1 more until the unit is removed from play. Costs 4 to play at first. Attack reduced from 4 to 2. Reincarnate cost is 6 mana. Reincarnate Warcry: Deal 2 damage to enemy units. Discover a 1/1 clone of a random unit in your hand. Deal damage to an enemy unit equal to the number of Structures you control. Look up any card by name or card text! Players will be able to select multiple Mana Costs when using this filter. Everything is on the line in our new game mode! The Gauntlet is comprised of four individual queues that players can compete in to earn unique rewards with each patch cycle. Every patch will feature four separate game mode variants with different requirements that change the way you build your decks and play the game. Compete against other players with the goal of reaching 8 wins, but be careful, one loss and your run ends. Players will only have a single entry per day into each of the two active gauntlets, so plan your decks carefully before entering. Players can only create decks that are comprised of Free and Common Cards. Decks must contain at least 10 God Cards from Norse, Greek, or Mayan. Players can only queue with Norse, Greek, or Mayan decks but they must contain at least 10 Gods. Players can only create decks that contain Rare, Epic, and Legendary Cards. This means that no Free or Common cards can be used. We have added a quick open option for players to open their card packs instantly. Players can either select the button, or press spacebar to use the quick open feature. Added an icon for Silence on Unit Bars. Cleaned up text formating for deck names. Added a delay when mousing over units inside of the Collection Screen. Units no longer say their voice lines in the collection screen. Turn timer has been reduced from 80 to 70 seconds. Cleaned up text formatting for Keyword Tooltips on Cards. Health reduced from 5 to 4. Warcry is no longer removed from a friendly unit when Aphrodite is killed. Can no longer target Summoning Stone. Ignores “protect” on return damage. No longer leaves behind Zombies. Health reduced from 7 to 6. Targets reduced from 4 to 3. Now kills units with 5 or more health. Avatars no longer die at end of turn. Avatars no longer have charge. Warcry: Deal 1 damage and root an enemy unit. Enemies have 1 less movement. Increased health from 1 to 2. Enemy cards cost 1 more mana. At the start of your turn, draw another card. Now Heals at the end of your turn instead of the start of your turn. Attacks now deal 1 damage to adjacent enemies. Attack reduced from 3 to 2. Fixed an issue where the Hindu Pantheon Quest was displaying an error message instead of the quest details. Fixed an issue where Sun WuKong Eagle Form was only adding +1 Movement instead of doubling. (Hotfixed). Fixed an issue where international versions were not properly displaying spawned unit tooltips (Hotfixed). Fixed an issue where Pillar of Creation did not have a spawned unit tooltip. Fixed an issue where several units had missing and incomplete Keywords in their descriptions. Fixed an issue where multiple unit effects would not appear in the combat log. Fixed an issue where Ares pulling an Inferno Cannon would cause Inferno Cannon to deal return damage. Fixed an issue where Pillar of Retribution would proc when changing ownership. Fixed an issue where Bakasura was unable to go through immunities and protect. Fixed an issue where Cabrakan’s ability would trigger when playing Poisonous. Fixed an issue where players were unable to rename a deck immediately after previously renaming one. Fixed an issue with cursor focus when re-entering the Deck Editor. The Pumpkin Patch will introduce some new Halloween flavored cards and designs to the game as well as some card balance and bug fixes! 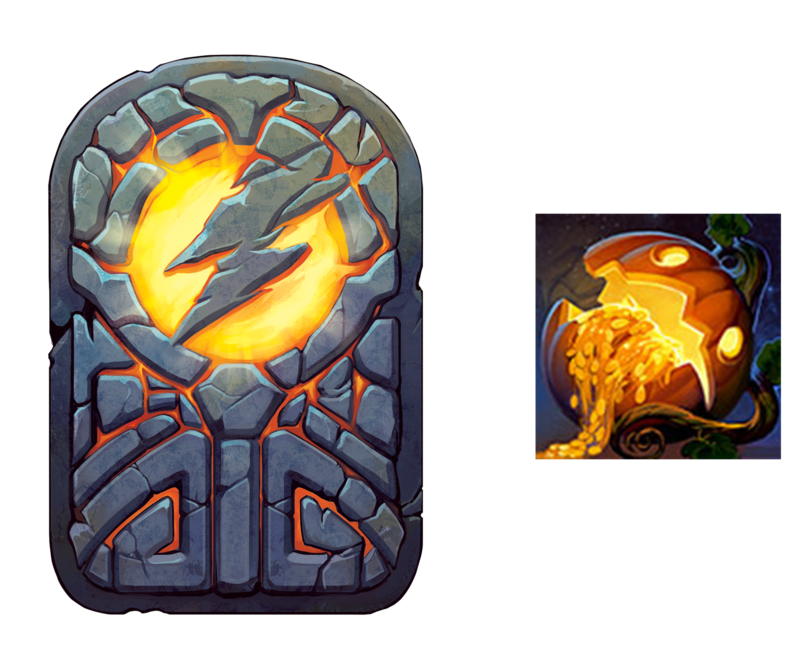 The Halloween Pack will introduce our first set of Limited Edition Skins for Hand of the Gods! These skins feature a new unit model, Special FX, Sound FX, and Card Art. Each Halloween Pack opened will unlock a skin, avatar, or card back you have not already unlocked. Halloween Skins are not disenchantable, and will only be available for the duration of the promotion. This has been changed to match the Hand of the Gods Logo. Players can no longer be matched against the same player twice in a row. New players will now be given a Bonus Pack for completing their first Casual, Arena, and Ranked match. These rewards will also be given retroactively to all active players. From this patch on, all players will receive a free Arena Ticket at level 1 which grants one free entry to the Arena. Ranks will reset with OB 0.31 and are planned to reset every 2 months going forward. This marks the start of our “Open Beta Season” and players can expect ranked rewards to be sent out with each future reset. Arena rewards for 10, 11, and 12 wins have been adjusted. Attack reduced from 5 to 1. Health reduced from 5 to 2. Spiderling is now type Beast. Now only gains +3/+0 when attacking. Added Special FX for Bulwark. Sprint can no longer be cast on Pillars. Anhur now properly stops Skadi from activating her Warcry. Anhur now properly stops Sagittarius from activating his Warcry. Illusion now properly clones buffs gained through Sobek’s ability. Fixed an issue where Kumbhakarna was unable to receive attack buffs if silenced before he was reincarnated. Fixed an interaction with Illusion that would kick both players to lobby. Fixed an issue where Satyr Pathfinder was improperly stopping certain Warcry effects. Fixed an issue where units that changed ownership through a spell effect could not have exhaustion removed through other card effects. Fixed an issue where a unit that changed ownership through a spell effect could attack on the same turn. Fixed an issue where spells countered by Pillar of Austerity would not properly remove the mana from the player that casted the spell. Fixed an issue where Cabrakans ability would not trigger if stunned. Fixed an issue where Fenrir’s model would not grow at the end of his owners turn if he had dealt return damage on the opponents. Fixed an issue where certain players were unable to challenge each other. 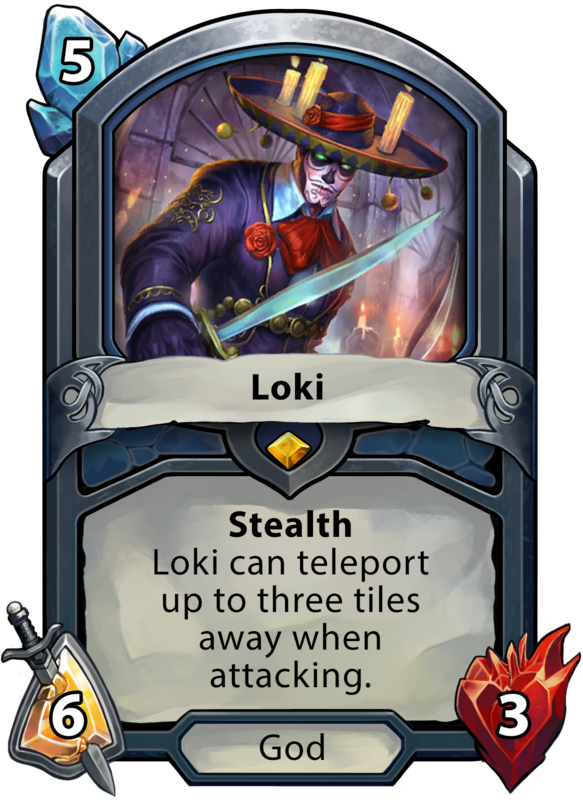 Fixed an issue where Illusion would improperly apply first-turn effects such as Stealth, even if the unit had already left Stealth. Fixed an issue where playing an auto-cast card while an animation was playing would put the card in an uncastable state.